Do you want neat handwriting? A quick fix will instantly give you the habit of neat handwriting. Just begin certain letters in a new place, and in a new way. Learn how to write neatly by making most letters rounder! Letters with straight lines are pretty easy. It's letters with curves that are more difficult. Unfortunately, most letters have some curves - 18 out of 26! Not to worry… The trick you're about to learn will make even the curviest letters nice and neat. I don't use it anymore. I don't need to. Using it once or twice was enough for me to fix my handwriting. That means, you won't need to use the trick for long either. You won't need lots of practice, just a little. Learn the trick. Use it as often as you can over the next few days. You'll soon find yourself using it automatically without any effort at all. The fonts you read every day on signs, screens, and pages, are popular because they're easy to read. They're easy to read, because the curves in their letters are almost perfect circles or parts of circles. Let this idea be your guide. It just makes sense that the more your writing resembles common fonts, the easier it will be to read. So start your practice for neater handwriting here by thinking of most letters as containing circles or part of circles. You'll use just 4 different starting points to make letters more rounded. The hands on the clock will start your letters in the perfect spot. The shape of the clock will magically guide your hand. 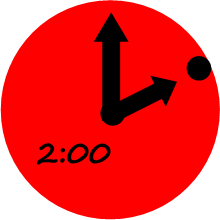 The most common starting point is 2:00. There are 9 letters with round parts that start here. The letters o, a, c, d, g, q, e, s and f have round parts that start at 2:00. 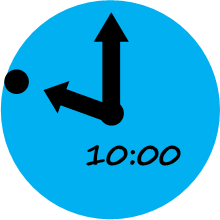 The second most common starting point is 10:00. There are 6 letters with round parts that start here. The letters b, h, m, n, p and r have round parts that start at 10:00. 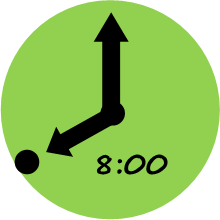 There are just 3 letters with round parts that start here at 8:00. 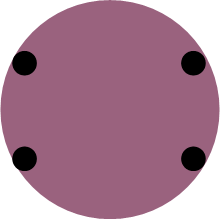 The curve on the letter u, the top curve on the letter y and the bottom curve on letter q, all have round parts that start at 8:00. 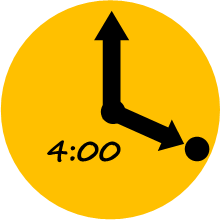 There are just 3 letters with round parts that start here at 4:00. The bottom curves of the letters g, and j, and y start at 4:00. I want to make this easy for you. So I've created a practice sheet (PDF), you can print to make your practice simple and fun. I don't want you to have to draw circles, try to remember which letters start where, or which letters to practice first. So I've outlined it all for you simple-step-by-simple-step. 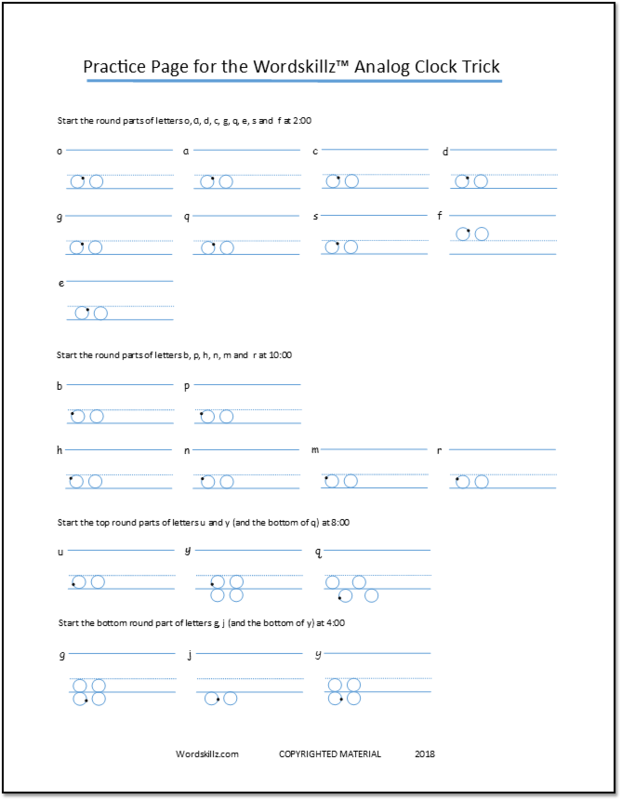 The practice sheet shows all the letters with curves, and provides circles to guide your hand. 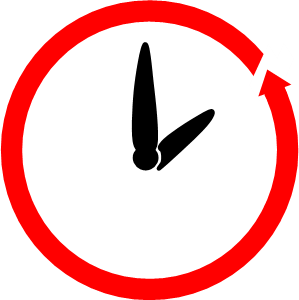 It also marks the starting points with a small black dot. Take your pen in hand and place it on the small dot. To download and print the PDF, fill in the blanks below, for INSTANT ACCESS! You'll receive instant access to your printable sheet, two BONUS tools, email support, and easy unsubscribe! This may all sound a little complicated, but believe me, it's worth a little effort! With the circle and hands of the clock guiding you, bad handwriting habits you've had for years will fall away. Before you know it, you'll have the neat handwriting you've always wanted. NOTE: YOU DO NOT HAVE TO COMPLETELY CHANGE YOUR WRITING STYLE!!! You are not supposed to write like a machine! Learn the trick, then apply it to your natural style. Form a habit of starting your letters in a more useful place, and forming them in a more consistent way. Your letters don’t have to be perfect, and you don’t have to keep thinking about the hours on the clock. Once the habit starts to stick, you’ll find you automatically make consistently rounded letters without the need to start them in a particular spot. Would you like to know the best reason for learning the Wordskillz™ Analog Clock Trick? Neater handwriting can make you more productive! You can spell better, read faster, and remember more easily!!! As already stated, when your handwriting is similar to fonts you read every day, it's neater and easier to read. When you know how to write neatly, your words and sentences look more familiar. Your brain can now focus on the content of your writing instead of struggling to read what you've written. As a result, your spelling and reading skills will now get reinforced whenever you write. In addition, your brain can more easily create a visual image of whole words and sentences (instead of struggling to make out letters). As a result, your improved handwriting can lead to an improved memory. New spelling words can be remembered more easily, and so can new ideas. The act of writing things down can now reinforce anything you're learning! The Wordskillz™ Analog Clock Trick is just one of the amazing things you learn when you do the WORDSKILLZ™ HANDWRITING QUIZ. between you and nice neat handwriting. Then get the help you need, completely customized and FREE! the Wordskillz™ Analog Clock Trick.